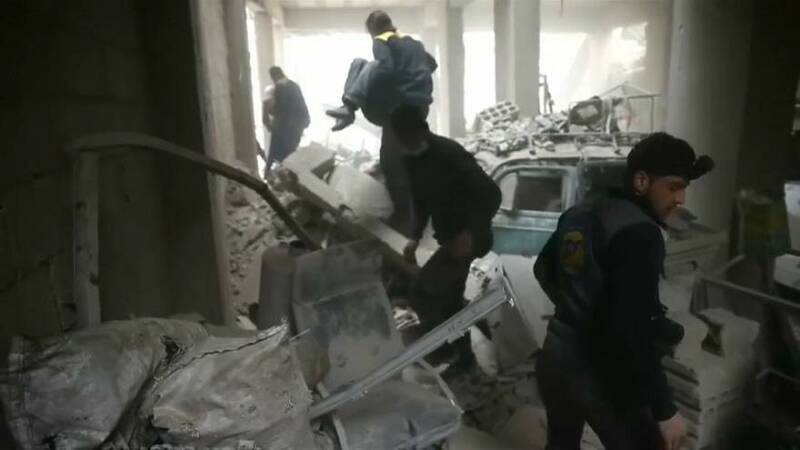 More than 500 civilians have been killed in a week of raids by Russian backed, Syrian government forces in a rebel enclave near Damascus. The Syrian Observatory for Human Rights group say the victims in Eastern Ghouta include 123 children. At least 29 civilians were killed on Saturday, including 17 children in the main town, Douma, in intense night time strikes that caused fires in residential areas. According to the NGO, the strikes are being carried out by both Syrian and Russian planes - although Russia denies direct involvement. The UN Security Council has been struggling to agree on a ceasefire resolution - a vote has been delayed several times since Thursday. In Douma, several bodies including children were transported to a makeshift clinic. Wrapped in blankets, they were placed in a room transformed into a morgue. Nearly 400,000 people live in Eastern Ghouta, a pocket of satellite towns and farms under government siege since 2013, without enough food or medicine. The civilian casualties and devastation are among the worst in Syria since the government captured rebel-held parts of Aleppo in 2016.